Welcome to the world of spying. Are you up to the top secret challenge? You’ll need to have your wits about you. Sharp sight, keen hearing and quick thinking are essential. The essential spy toolkit gets a dangerous new look, with brand new gadgets and a cool new Spy Ear snooping device! Want to be a master of espionage? Then you’ve gotta have it! This top-secret, ultra-hi-tech briefcase is our ultimate bestseller – and it’s just got even better! The upgraded gadgets have everything you need to go undercover and make sure suspects can’t shake you off their tail! There are binoculars to give you sight as sharp as a hawk, and rear-view glasses that disguise you and let you see what’s going on behind you. Plus the cool new Spy Ear device, where you pretend to be casually listening to your headset – but really you’re eavesdropping on baddies from several meters away! Spy Briefcase contents: secret missions file, Spy Ear device, binoculars and rear-view glasses. The spy components (gadgets) that come with this briefcase will help you on your way to becoming a spy master! Rear view spy glasses See what’s going on behind you with these fun rear view spy glasses! They have mirrored outer edges which reflect the rear view. Comes in one size, will fit adults and children. An effective method of following someone or watching what they are doing without them noticing, is to be in front of them (they’ll be looking for someone behind). Wear your glasses and walk a short way in front of your suspect. If they stop and talk to someone, you can watch what they’re doing while pretending to do something else. Listening Device: Push the spy Listening On/Off switch to the ON position to turn on the receiver. Place the earphones in your ears. Point the receiver towards your target to activate sound spying. If you want to hear through a closed door or wall, place the receiver against the surface of the door or wall. Spy Master Briefcase Spy Kit (Totally top secret) Welcome to the world of spying. Are you up to the top secret challenge? You’ll need to have your wits about you. Sharp sight, keen hearing and quick thinking are essential. The spy components (gadgets) that come with this briefcase will help you on your way to becoming a spy master! See what’s going on behind you with these fun rear view spy glasses! They have mirrored outer edges which reflect the rear view. Comes in one size, will fit adults and children. Push the spy Listening On/Off switch to the ON position to turn on the receiver. Place the earphones in your ears. Point the receiver towards your target to activate sound spying. Small World Toys presents the “Secret Agent Master Spy 4-in-1” set – a perfect intro to the fine art of super-sleuthing. Comes with rearview glasses, a magnifying glass, and decoder pad with ink, fingerprint powder and brush, invisible pen, plus so much more! Science kits can entertain and introduce kids to the wonders of knowledge – simple, easy to assemble, with all needed components in one box. Recommended for Budding Detectives ages 8 years and up. 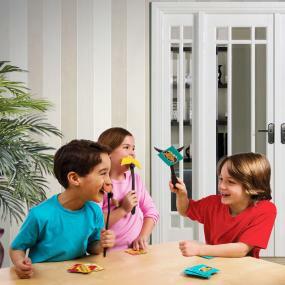 Small World Toys is focused on developing and delivering the safest, highest quality products for your kids. Safety and well-being is our number one priority. Small World Toys’ own rigorous safety and testing protocol provides protection of the highest order. We test all our products through independent and accredited testing labs to the applicable U.S. mandatory federal safety standards. Small World Toys believes play is an integral and necessary part of a child’s development and education. This philosophy is at the core of our product development and drives us to continue creating and sourcing new and innovative products. In addition, a child’s experience with our products should be a positive one. We pride ourselves in developing innovative designs that encourage creativity and builds self-confidence through mindful, hands-on engagement. Small World Toys: Making Dreams Come True since 1962. Comes with Rearview glasses, magnifying glass, disguise mustache decoder pad with ink, fingerprint powder and brush, invisible pen, plus so much more! TrackMaster motorized engines from Fisher-Price have been redesigned so you can experience the Island of Sodor like never before! With enhanced speed and performance, these engines go faster and climb steeper inclines, driving Thomas & Friends to greater speeds, taller heights and bigger adventures! This multipack features five of your favorite Thomas & Friends engines, including a special edition racing Thomas. Flip the switch and watch them race along on another exciting journey. They’re the perfect addition to your collectable, expandable, motorized TrackMaster world! Features: Motorized TrackMaster engine multipack. Redesigned TrackMaster engines feature enhanced speed and performance. Each engine is a great addition to your expandable, connectable, motorized Thomas & Friends TrackMaster world. Motorized train play is compatible with most TrackMaster track and playsets (sold separately). Ages 3+. Each engine requires 2 AAA batteries. 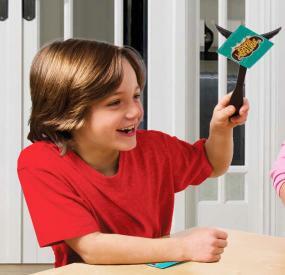 Moustache Smash is the matching game that is speedy, silly-looking fun! Each player keeps a moustache held up to their face. As each card is turned over, watch for a card matching your ‘stache in either color or shape. See a match, then smash it fast! Be the first to smash the ‘stache card and your moustache’s suction cup will pick it up and you score a point. But don’t smash the wrong card, or you’ll pay a penalty and lose two of your cards into the pot. Collect the most moustache cards and you win! Match your ‘Stache, then Smash! Each player holds a moustache under their nose for the entire game. Remember what it looks like! Because as each moustache card is turned over, you must watch for a match to your ‘stache: either the same color or the same shape. If they match, then smash that ‘stache card! If you’re the fastest, the suction cup on your moustache will snap the card up and you get the point. If you’re not fast enough, another player’s ‘stache will score the point. If an all-play Moustache Pass card comes up, everyone passes their moustache to the player on their left. This refreshes the game – and your silly moustachioed look – and keeps you on your toes. Don’t forget what your new moustache looks like or you might smash the wrong ‘stache card! Who wins? When the entire deck of 32 moustache cards is gone, the player with the most moustache cards wins! Kids will love the game because of the silly moustaches they wear. 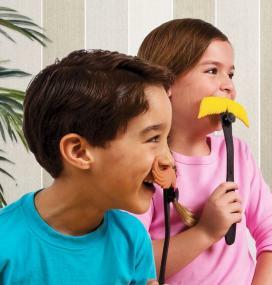 While grown ups will love that the game teaches kids spatial recognition and hand-eye coordination as kids have to remember which moustache they have under their nose and comparing it to the pictures of other moustaches. It’s suspenseful, quick-thinking fun. Age Grading and Contents Great for three-six players, aged 7-years and up.Comes with six (6) Moustache Sticks, 32 Moustache cards, and one (1) Instruction Sheet. Remember which moustache you?re wearing and watch for a card match. If it?s the same color or shape, SMASH that ?stache card! If you?re the fastest, you get a point. A Moustache Pass card makes everyone pass their ?stache to their left. Don?t forget what your new one looks like or you might smash the wrong ?stache! When the entire deck of 32 moustache cards is gone, the player who has collected the most moustache cards wins! Includes: 6 Moustache Sticks, 32 Moustache Cards, and 1 Instruction Sheet.